I work as a Lead Architect at Land Registry. We are a trading fund that is responsible for registering the ownership of land and property in England and Wales. Land Registry is a non-ministerial department, but is under the umbrella of the Department for Business, Innovation and Skills (BIS). I take a keen interest in how other organisations (in and out of government) operate, particularly where the user needs and capabilities are similar to Land Registry’s. So, when it was announced recently that services that meet a certain criteria will be self-assessed (i.e. by departments themselves, rather than GDS), I saw it as a fantastic opportunity to further my understanding of other government departments, as well as my knowledge of the Digital-by-Default Service Standard, Service Design Manual and the Technology Code of Practice. After some short training on service assessment, I joined the BIS family of assessors and scheduled my first ‘proper’ assessment. The service being assessed was Orphan Copyright Works. 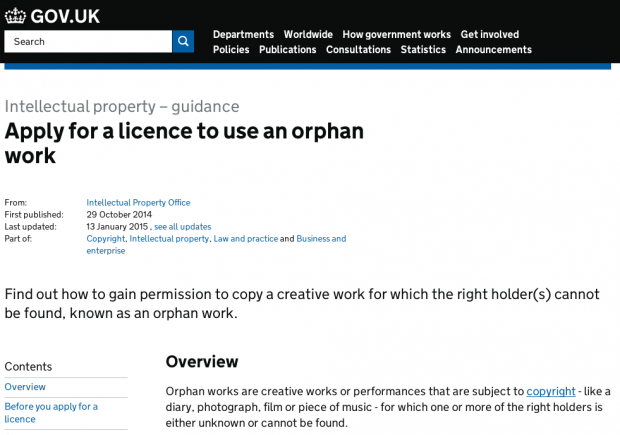 An orphan work is a creative work/performance for which one or more of the owners of the copyright can’t be located following a diligent search. At present, these works can’t be used in exhibitions, books, TV, documentaries and websites. However, recent legislative changes empowered the Intellectual Property Office (IPO) as the authorising body for this sort of work. Therefore, IPO have designed a digital licensing service, allowing the legal commercial and non-commercial use of all types of orphan creative works within the UK. The service assessment was intended to support the launch of the public beta for Orphan Copyright Works. The assessment panel was made up of four people from across the many BIS organisations, ensuring a mix of skills was available to thoroughly test the 26 points of the standard. On top of this, IPO politely hosted a number of observers, mainly to see how an assessment operates in preparation for being on a panel in future. I am based in Plymouth, so I made the long journey (every journey from Plymouth is long!) to Newport on the morning of the assessment. After paying to get into beautiful Wales and navigating my way (incorrectly) to a supermarket car park, I eventually arrived at the IPO offices in Newport. Responsible for services that satisfy the needs of businesses as well as citizens. Responsible for official and official-sensitive information assets. Equipped with our own highly-skilled in-house IT/IS capability. Supporting the growth of the UK economy. Blessed with a talented set of professionals (I am unashamedly sucking-up!). The only immediate non-geographical difference was that Costa coffee is available in the coffee lounge (no preference implied for any particular chain of course). The assessment started with a description of the service. What I learned from this is that, unlike other ‘rights’, copyright doesn’t have to be registered to be owned. This is great, but does make it quite easy for works to become orphaned. The example given was where a museum (or similar) wished to use a letter sent by a soldier in WWI; if the solider (or his family/descendants ) can’t be found, the museum would not be able to get permission to use the work in their exhibition. Until now, of course! Quite rightly, the bulk of the assessment process is about how the service is being delivered in a user-centric manner. The drive to start with user needs has clearly been well understood at IPO; user needs have been thoroughly explored to enable the design of the service to this point. This process started with a consultation, but the service team at IPO continue to explore these needs iteratively. Users are those wanting to use orphan works (aka licensees) and those that own the works (aka rights holders). The service will provide a lawful way for people to use an orphaned work, which will also enable future recompense for rights holders. The service’s licensing scheme allows people to use orphaned work within a given set of circumstances. For example, the user must have carried out a diligent search for the rights holders. A license fee (based on the market rate for a similar work being used in a similar way) is an important user need for the service to ensure that future recompense can be provided to rights holders. Some interesting user needs are still being explored, such as being unable to find all of the rights holders, which can be particularly challenging for some creative works. For example, a film may have lots of copyright holders, meaning it can be very difficult to get permission from all of them. In line with the premise of iteratively developing the service, the law is still being ‘tweaked’ to work through these issues. The remaining areas of the assessment included security & privacy, tools & technology and analytics & benchmarking. Many of these questions were answered in the user needs section, with some questions to provide further clarity, as well as some specific questions around technology, the key personnel and their roles; the Senior Information Risk Owner (SIRO), Accreditor and Information Asset Owner (IAO) for example. After more than three hours of probing and prodding, we were really pleased with the information we had been given and impressed with the thoroughness of the IPO service team’s preparation and presentation. There was clear evidence throughout that IPO have designed and developed the service in line with the service standard. As a result, the service successfully passed its assessment and has now been launched as a beta service. I personally look forward to being part of more panels in future and learning even more about the awesome work going on across government.